If the rumors are true, Apple is just about ready to release iOS 4.2.1 for current models of the iPhone and iPod touch, and more importantly, the iPad. My quick list of things that I like and dislike about the iOS 4.2.1 software upgrade for the iPad are up after the break. Multitasking is super easy in iOS 4.2.1. All you have to do is double-click the home button and the multitasking bar shows up. To switch to a different app all you have to do it tap it's icon. If you want to end a running application, tap and hold it's icon, and when the icons start to giggle, tap the red icon that appears over the top left of the icon. Multitasking done easy. 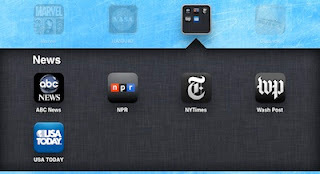 With the arrival of the Multitasking feature, Apple has created an iPad control bar. With the Multitasking bar visible, swipe to the right to display the iPad controls bar. From here, you can access the iPod application and the standard iPod controls, adjust the volume and screen brightness, and turn the screen rotation lock on or off. (I'll talk more about that last one in a minute.) I really like having access to the screen brightness controls without having to go to the Settings application. With iOS 4.2.1, iPad users will be able to work with multiple Exchange Active Sync (EAS) accounts. This will be good news if you use your iPad with your corporate email server. If you don't, or can't use your iPad with Microsoft Exchange, the EAS features work with other services that use the EAS protocol, like Google's GMail and Calendar applications. Once I followed Google's directions for setting up mail, calendar, and contact sync with iOS 4, I had a similar experience to that of Synergy in HP webOS. Very nice! On the surface, a simple feature like Folders can be easily overlooked. But I like it because of the fact that Folders helped my slim down my eight pages of apps down to three. It's super easy to create a folder; just drag one icon over top another and let go. That's it! Give your new folder a name if you don't like the default name and you're off to the races. With folders, you can group up to 20 of your apps together. Folders was a big help with cleaning up the clutter on my iPad. Now I have a Dad's Games folder and Kids Games folder to hold everybody's games without clogging up the app launcher pages. For the most part, I really like the features of iOS 4.2.1. There are a lot of things, big and small, to like in this software upgrade. For some reason, this one really bugs me. First of all, I like the convenience of having an easy to access screen orientation lock, and having a hardware button was fantastic. With iOS 4.2.1 on my iPad, to lock the iPad's screen in it's current orientation, I have to double press the Home button, swipe to the right in the Multitasking bar, and then tap the Orientation Lock button. Ok, count with me...1...2...3...4...5. It now takes five button presses/taps/gestures to do the same thing I was able to do with the hardware orientation lock. And to add insult to injury, when I was playing with iOS 4.2.1 for this article, I learned that the damn Mute switch controls don't even mute the iPod application. What the hell!? The one application I was expecting the Mute switch to work with and it doesn't. If there is a silver lining to this mute mess is that I discovered that if you double-click the Home button while the iPad is locked and the iPod application is playing music, the clock portion of the screen is replaced with the iPod controls so it becomes sort of easy, if not a little bit annoying to, to pause whatever it is you are listening to. But it's still three clicks to bring up the controls and a single tap to pause the iPod. I understand why Apple wanted to switch the iPad's hardware orientation lock to a mute switch: so developers only have one standard to write applications to. Personally, I would have liked to see Apple put in a preference option in the Settings application to restore the original functionality of the iPad's Orientation/Mute switch. 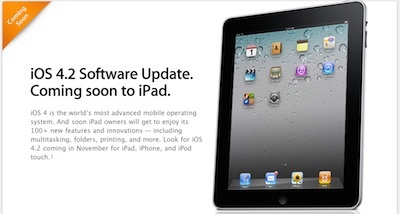 All in all, iPad owners are going to really like the enhancements in iOS 4.2.1 for iPad.